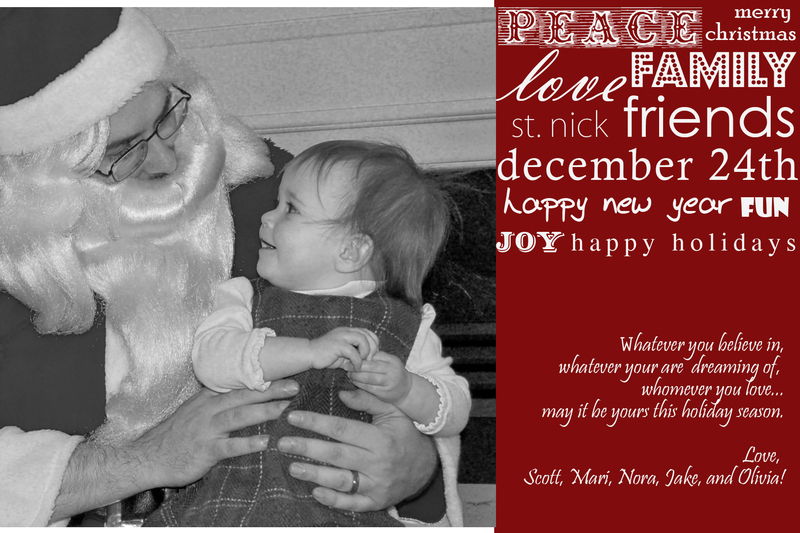 We are conserving money and trees this year by doing the bulk of our Christmas cards in electronic format! I think they are still super cute, though! “Santa” is Olivia’s daddy, and she was super afraid of him at first even though she watched him get dressed into the costume. As usual, she got over it very quickly. This has been a busy, busy year for us. Jake is a few hours away from being eligible to take his driving exam, and is doing well in school as well. He was just recently inducted into the French National Honors Society–one of only 7 students at his high school to receive this honor. He is taking lots and lots of pictures, and Scott and I never cease to be amazed at how well he does. His pictures show quite an artistic eye, and often take my breath away. Olivia is running and talking up a storm!! She has started daycare one day a week for the socialization and the education, and to have a spot when I decide to go back to full time days. They just love having her there and I often have to force her to leave, she loves it so much. She has twelve teeth currently and can speak over 3 dozen words. She can also sign close to that many, including “nurse” “thank you” “eat” and can identify nearly all the parts of her face. We are amazed at how quickly she is learning and developing. She also adores her older siblings. Scott has recently started a new job at Wells Fargo and is excelling. He is working in the mortgage customer service division, and I am so proud of him! It’s been a bit of an adjustment to be working the Monday through Friday schedule, but he is enjoying having weekends with his kids for the first time in years! Beats the restaurant business any day! I am currently working nights as an intake coordinator locally and nannying during the day for a close friend of ours. Their daughter is adorable and she (almost) feels like family. Olivia loves it there, and I love that she gets to be with me. Our family is very lucky to have found these arrangements, because it gives me a lot of time to be home with the baby and saves a lot on daycare as well! I am actually considering returning to school in the spring to become a counselor — it seems that my passions may lie in that direction. Just a quick update on what’s going on with the Griders in 2010. We hope to hear from you/yours this holiday season as well. Enjoy the loved ones in your life this holiday. ~Scott, Mari, Nora, Jake, Olivia, and all the various pets in our home!